Today we release the ability for you to accept calls from Agero directly inside Towbook! If your company is using the Towbook motor club feature, you can receive your calls on our new Accept/Reject screen inside Towbook. No matter what screen you’re on in Towbook, the new call “Accept/Reject” screen will appear for you as a pop-up message and an audible alert will sound, notifying you that a new call is available. All you have to do is accept or reject the call! See an example of the new screen below. If you don’t accept or reject the call within 4 minutes you will receive a phone call from an Agero Dispatcher – just like you do today. The pop-up and audible alerts appear anywhere in Towbook – you can be in Accounts, Impounds, Reports or Settings and you will still receive the notification. 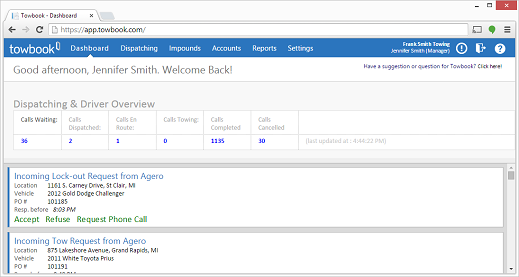 Once you accept the call, the job will be automatically added to the Towbook dispatching screen as a new call. You also have the option to turn digital dispatching on or off. If digital dispatching is turned off then Agero knows to call you. If you’re interested in learning more about our new dispatching option, please click the link below.